"Thanks and farewell Concorde, you are a star!" 2006 The Forgotten Concorde is Born Again! Until 2004, G-BBDG 'Delta Golf' had been languishing at Filton Airfield, Bristol since 1981 unseen and almost forgotten. Now this beautiful Concorde is open to the public as the star attraction at Brooklands Museum, Weybridge. Her original task was to obtain certification and 'route-prove' prior to Concorde entering service. 'Delta Golf' was also used for a wide variety of early promotional images. Although 'on standby' for a period, she never entered commercial passenger service and later was only used as a ground based, test-bed for later modifications that were developed for the flying fleet. She was however the first aircraft ever to fly 100 passengers, guests of British Aerospace, at twice the speed of sound. But when Concorde was taken out of service Delta Golf became a valuable museum exhibit and British Airways offered her to Brooklands Museum, Weybridge, where many British airliners were built in years gone by, including the cockpit and other sections of Concorde herself. Brooklands was also the home of the famous banked motor racing circuit, sections of which still remain. 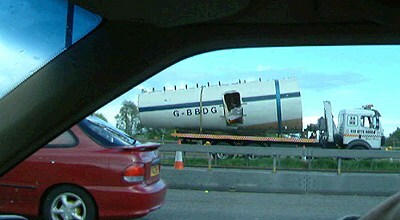 In 2005 BBDG was reconstructed and is now one of Brooklands' star exhibits. There is much else to see and discover at Brooklands and a visit is very much recommended. The fully reconstructed aircraft now features 'The Concorde Experience' - an onboard exhibition and two video presentations. 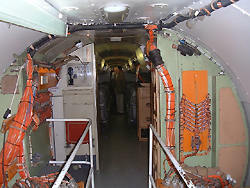 The visit includes a 'walk-through' of the exhibition in the aft cabin, a video of Delta Golf's history, both during her flying days and during her reconstruction at Brooklands, a unique chance to view the airframe, milled from solid ingots of special aluminium alloy, and finally to sit in Concorde's very own seats in the forward cabin to watch an exciting video presentation about the aircraft in flight. NB Book your 'flight' early in the day as places are limited and you may well miss out if you leave it too late! Delta Golf is the only Concorde to feature the original British Airways livery of the passenger services of the 1970s. Following the official opening by Prince Michael of Kent on 26th July 2006, large numbers of visitors have been making their way to Brooklands Museum to see for themselves this stunningly beautiful and exciting aircraft. 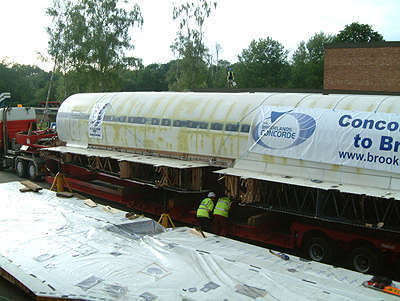 One month later, on June 5th 2004, the central fuselage arrives and is positioned between the wing section prior to reassembly. March 2006 - Concorde wins the BBC's Design Quest!!! 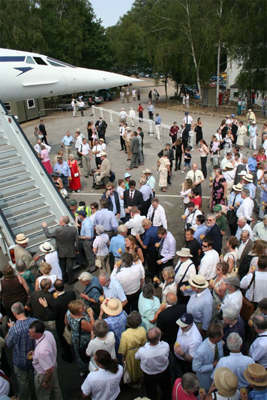 From August 2006, The Brooklands Concorde Experience comprises a comprehensive exhibition area and a 'walk through' of the whole aircraft. For more details Brooklands Museum Web Page. 28th Anniversary of first Concorde Commercial Flights, January 21st 1976. On the 28th Anniversary of Concorde's first commercial flight on January 21st 1976. Alpha Bravo was towed from the maintenance area and handed over to BAA in a short ceremony for eventual display at Terminal 5. Although the new terminal will not be completed until 2005, Concorde has been put on display near 27R at the eastern end of the airport. She can be clearly seen from the north side of the airport. No engines are now fitted. For more information please see Latest News at www.concordesst.com and visit the forum. The final aircraft movements were the move by road and sea-going barge of Alpha Alpha to The Scottish Museum of Flight near Edinburgh in April 2004, the movement of an early aircraft Delta Golf, to Brooklands, and the installation of Alpha Bravo in Terminal 5 when completed, at Heathrow. Concorde G-BOAF flew into retirement at Filton, Bristol on 26th November 2003, where she was built. She left Heathrow at 11:30am as BA9020C landing at 13.07 at Filton following a supersonic sector over the Bay of Biscay and a flypast over the city of Bristol. The landing was accompanied by a single Spitfire. There will never be another chance to see Concorde in the air! Now that they have all arrived at their respective museums, they will never fly again. For more information please see Latest News at www.concordesst.com and visit the Concorde forum. For a video of the last take-off please click here for a 636kb MP4 version. A full size 640x480 version of the take-off is featured on The Amateur CD. The first of the last departures was to Manchester at 10.27 on Friday 31st October 2003, arriving at Manchester Airport an hour or so later. We are delighted to include this photograph and personal recollection of Concorde written by Gary Theobald of Windsor. Having lived in Windsor for six and a half years we became very used to Concorde flying over at least twice a day and we always stopped to watch her flying over our house whether landing or taking off. When BA announced that she would be 'retired' in October 2003, I promised myself that we would make the short trip to Heathrow to see her take off at close hand. It was a lovely autumn day on Saturday 18th and we decided to make the most of the fine weather. As the aircraft were approaching from the west, we decided we would have to make do with just seeing her land. Myself, my partner Carolyn and our 2 toddlers Peter (3) and Robert (2) were surprised to see hundreds of other fans in whatever vantage point they could get around Stanwell Moor Road at the end of the runway. At 17:35 we were treated to a magnificent sight as she approached from out of the blue sky. There must have been many rolls of film used that evening as we all got a front row seat of the beautiful lady herself. We all enjoyed witnessing the landing and I realised that I had never actually seen touch down before. Both our boys enjoyed seeing her at close proximity but I don't think that they really appreciated that it was the same object of beauty that they always stopped to watch flying over the back of our house. As we were about to leave to go home, a chap standing next to us said, "Right, it's off to Hatton Cross to see the take off for JFK now!" We couldn't resist and although we were not too sure of the best vantage point, we had to go with the hordes. It was not too hard to work out where at Hatton Cross was the best place for the take off as there were even more people there with cars parked on almost every bit of grass verge. We parked too and waited, although 'she' was delayed by an hour, it was well worth the long, cold wait to see her lift off into the dark sky with her afterburners ablaze. What a fantastic sight and one to be savoured forever. One of my biggest regrets will remain that we never managed to find the money to fly in her and I will always be envious of my parents who were lucky enough to experience a Christmas Champagne flight in her. British Airways today announced the locations where it intends to retire its fleet of Concordes after commercial services ended at London Heathrow last Friday afternoon. British Airways' chief executive Rod Eddington said: "Since we announced the retirement of Concorde we have received a wide variety of interesting proposals from organisations wanting to give the aircraft permanent homes. "We have chosen the final homes based a number of criteria: their ability to properly exhibit and preserve the aircraft, their geographical location and accessibility to the public. "We are working closely with each of the new homes to make sure they show off each Concorde at her best." A technical feasibility study, headed by Captain Mike Bannister, Concorde chief pilot, as to whether a single Concorde can be maintained for non-commercial flying at public events, has been concluded. Rod Eddington said: "A detailed study with Airbus has regrettably led us both to conclude that it would not be possible. "The technical and financial challenges of keeping a Concorde airworthy are absolutely prohibitive. Airbus has told us that they are unable to support such a project, whether it be for British Airways or anyone else. "While there is no prospect of operating an aircraft for flypasts and airshows, in the future Concorde will be accessible to the public with the majority of aircraft located in the UK." 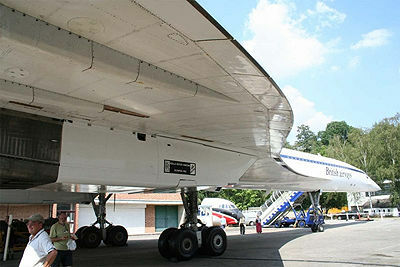 British Airways also announced today that it will be holding an auction of Concorde memorabilia on Monday, December 1. The auction, will be conducted by fine art auctioneers Bonhams, at Olympia Exhibition centre, in Kensington, and items will include a machmeter, a nose cone and Concorde pilot and passenger seats. Profits from the auction will go to charity, with a key beneficiary being 'Get Kids Going! ', a charity which gives disabled children and young people the opportunity to participate in sport. 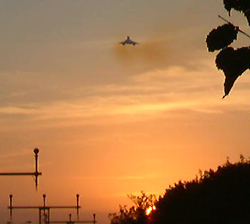 Concorde, 19th September 2003, at 18.55, disappearing into the setting sun! 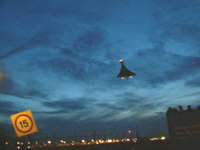 Despite much publicity from the British Airports Authority suggesting that the public should watch the event on television, thousands of loyal Concorde supporters and enthusiasts came to Heathrow Airport to witness the last day of commercial supersonic flight. The day began for some at 6.00am when a radio station was expected to broadcast throughout the day from The Green Man PH, Bedfont. In the past weeks the pub had become a regular haunt for Concorde spotters as it was so close to one of their favourite viewing points at Hatton Cross. The first take-off of the day was in the morning when a flight departed for Edinburgh, the last destination of the UK Farewell Tour. In the early afternoon a second take-off marked the very last passenger departure from Heathrow by a supersonic Concorde airliner. At 4.00pm these two aircraft returned to Heathrow as the first and second landings of the planned celebratory triple landing. The final landing of a passenger carrying Concorde followed just a couple of minutes later. It is rare for any technological advance to be scrapped and not replaced by something similar, or better, or faster, yet Concorde falls into this category. Aviation has taken a giant step backwards, preferring to concentrate on the bulk transportation of people in ever larger aircraft at subsonic speeds. It is unlikely that supersonic travel will be an option again for, perhaps, 50 years or more. There are a number of reasons for this. The first must of course be cost. The cost of the aircraft design, subsequent testing and development and final production. In addition the actual cost of each ticket is a major consideration once in service. Another reason for the non-appearance of a successor to Concorde has been the world situation with political uncertainty from time to time depressing air travel as well as economic uncertainty, not least the cost of oil and hence fuel. In 2003 this has been further complicated by the Americans desire to boycott anything French following France's refusal to back the American and British invasion of Iraq. This resulted in French Concorde operations ceasing almost overnight, and Airbus, the aircraft's sole source of spares support and back-up, pulling the plug on the aircraft also, despite the major investment made by both BA and Air France following the Paris crash, which, it must be said, was NOT directly attributable to the aircraft itself. Concorde, despite her technological complexity, was to prove one of the safest aircraft ever to fly. Nonetheless, the withdrawal of French support left British Airways high and dry with no option but to cease Concorde operations too, although it is very likely that the accelerated withdrawal was not how they really wanted to play it, especially as bookings through the winter to Barbados were holding up reasonably well, and certainly at a profitable level. But without manufacturer support, Concorde flights were doomed. 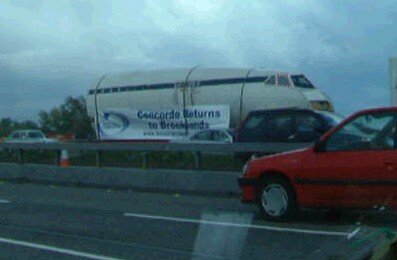 Concorde's demise has led to a surprising reaction from the public. Whereas in the 1970s there was much opposition to the plane, the noise, the pollution, the elitist image, this has, in the main, given way to a demonstration of affection, in particular an admiration for her stunningly beautiful lines. 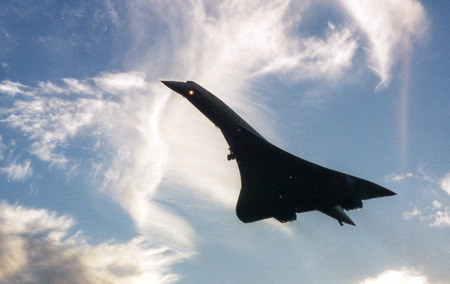 If hundreds of Concordes were roaring overhead every day, then public opinion would not have been so kind, but as a rare and beautiful bird, the public loved her and mourn her passing. That rare bird will never be seen in the skies again. Whether this is a loss or a gain, I will leave it to you to decide with the help of some of the videos available on this page! $60,300 winning bid for two seats on the last flight of all! Two Concorde tickets, JFK-LHR 24th October 2003, were auctioned by Ebay this week. Not only were the tickets up for auction, but a bundle of extra goodies before and after the flight to make the trip a true lifetime experience. The auction ended Oct-20-03 09:00:36 Pacific Daylight Time. 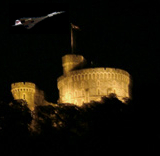 Following my request to the superintendent of Windsor Castle, Major Denman, HM The Queen graciously consented to the illumination of The Round Tower at Windsor Castle on the occasion of the final commercial departure of Concorde BA001 from London Heathrow to John F Kennedy Airport, New York on 23rd October. The flight departed at 7.20pm to the east, then turned to pass by Windsor to the south where crew and passengers should have had a good view of the salute. I am immensely proud that here in Windsor one of the most famous of all British landmarks could salute this classic aircraft as she departed Heathrow for her last commercial flight. Not only was Concorde herself honoured, but all those who were involved in her conception, design, construction and subsequent operation over the last 47 years. The Round Tower was floodlit from 18.00 until 20.15. The significance of this salute cannot be underestimated. The floodlighting of Windsor Castle was a rare occurrence at that time, only permitted for major state events or during the Royal Windsor Horse Show. The illumination for Concorde's departure on 23rd October symbolised the great affection that so many of the public at large felt for the aircraft and formed a more than fitting farewell as she passed over Windsor for the last time in commercial service. A view of Concorde at 2000ft as she passed over Windsor. Supersonic commercial flight began on 21st January 1976. 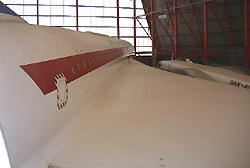 The following article was published before it was known that Concorde was to re-enter service in November 2001 and to be finally withdrawn in October 2003. Updates elsewhere on this page summarise events since this article was written, running up to Concorde's withdrawal from service. 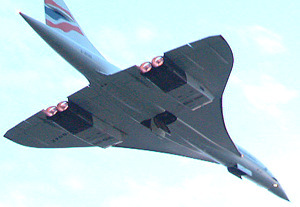 Many Windsorians have close connections with Heathrow Airport, London, and most will still admit to casting an eye upward to watch Concorde as it passed overhead, before, that is, it was withdrawn from service following the Paris disaster in the summer of 2000. The aircraft must be unique in so many ways, but not least because it is always referred to as if there were only one. "Concorde is coming", goes the cry, not "A Concorde is coming..." a 747, yes, a VC10, a Tristar (L-1011 to the Americans), even a Hurricane or a Spitfiure, but not 'Concorde', it is Concorde, pure and simple, the one and only, stunningly beautiful, Concorde! She is addressed as if a friend, and always with great affection! The crash in Paris came as a major shock. All air crashes are horrific, but the loss of the first Concorde and its passengers and crew had an extra dimension. The aircraft seemed to be leading a charmed life up to that moment, ever since its first commercial flight an astonishing 25 years ago this week. On 21st January 1976, two Concordes took off simultaneously from London and Paris, the British Airways aircraft departing for Bahrain in the Arabian Gulf, and Air France flying to Rio de Janeiro via Dakar. The event was broadcast live on both radio and television, with split screen images of both aircraft leaving the ground at the same moment. Well, it was claimed to be the same moment as it could not be seen that the British were the ahead of the French into the supersonic passenger era, but to my eyes the BA Concorde pipped the French by leaving the ground first!! Some years earlier, during development and trials of the Anglo-French project, a diplomatic 'e' had been added to 'concord' to reflect the French participation! On the day of the inaugural flights, residents in Windsor were to be seen in their gardens and stopping in the streets to watch as Concorde flew over. It was an emotional moment. Despite the raging arguments over cost, the threat of cancellation by Prime Minister Wilson, its noise and its elitist image, Concorde was British (with a little help from the French!) and we were proud of her. That pride remains to this day for many Windsorians and it is for this reason that the Paris crash had an added sense of tragedy. I am aware that some think less highly of Concorde. The operation of supersonic aircraft is believed by some to be totally unacceptable. The air fare is prohibitive for most, the noise, though reduced, is still far higher than other commercial jets, and, from an ecological point of view, its fuel consumption is excessive as is the resultant pollution, but hey, what the heck, its ours and many of us remain proud, if only because the aircraft remains a stunningly beautiful piece of sculpture, supreme technical expertise and craftsmanship. British Airways Concorde operations from Heathrow, London, ceased permanently in October 2003. Air France took their aircraft out of service on May 31st 2003. So ends an era that started in 1956 when on 5th November of that year the Supersonic Transport Aircraft Committee (STAC) was established to study the possibility of building a supersonic airliner. Public reaction to the news that Concorde was to be withdrawn from service was, almost without exception, one of dismay and great sadness. No other aircraft had enjoyed such public affection or generated such a reaction on such a scale. Everyone I talked to at the time expressed a great fondness for the plane, and admitted to always looking up and watching as she passed overhead, even after over a quarter of a century of service. Another passing that was similarly sadly received was the decommissioning of the Royal Yacht 'Britannia'. Regardless of the ship's royal connections, she was admired worldwide and a valuable ambassador for the UK, a role that Concorde had also performed with great aplomb! Also, the public at large may have felt a similar reaction when the great liners such as the 'Queen Elizabeth' and the 'Queen Mary' were withdrawn from service. Concorde attracted great interest and affection, and this is testimony to her remarkable appeal. It is unlikely that we shall ever see the like again. Ear plugs essential as she passes overhead at just 100 feet! British Airways planned a Farewell Tour of the UK in the last week of operations. Concorde left London Heathrow each weekday from October 20th to visit 5 major UK cities. These were Birmingham (20th October), Belfast (21st October), Manchester (22nd October), Cardiff (23rd October), and Edinburgh (24th October). Departure from Heathrow was scheduled for 10.00am and take off about 20-30minutes later. On Saturday, 18th October, there was a BBC TV Concorde special on Timewatch, on BBC2. The UK tour ended with three aircraft flying on the last day. One made a trip to Edinburgh and back, the second made a flight over the Bay of Biscay, and the third undertook the last BA002 service from New York. These three flights made consecutive landings at Heathrow at the end of the day, just after 4.00pm, with the New York service being the last to land. And that was it... Supersonic passenger flight is now a thing of the past. Thanks Concorde, you are a star! Some stories about Concorde are a little scary, especially when something goes wrong! As Concorde cruises at around 55,000 feet, any problem at that altitude where a chance of decompression exists requires the flight crew to lose height fast. The best way to do that is to throw the aircraft onto its side and point it downwards! On one occasion, on a flight from New York to London, one of the engines failed with a bang. The square air ducts ahead of each engine feature variable geometry vanes. These reduce the speed of the air from 1400 mph to around 350mph as it enters the engine itself. Apparently, on this occasion the vanes somehow slammed shut, starving the engine of air and causing the massive volumes of fuel being pumped in to explode. The flight crew instantly initiated the emergency routine, diving to a more life sustaining height of about 20,000 feet before looking more carefully into the problem. Picture this... a huge bang, Concorde lurches onto its side and descends earthwards at great speed! Apparently a well-known pop star onboard at the time had to cancel some concerts subsequently as he was suffering from 'stress'! Not surprised! But all was well in the end, the aircraft diverting to Shannon and the passengers travelling on to London in a more conventional aircraft. the setting sun reflecting on her underside. On 16th September 2003, I took my children to see Concorde take off at Heathrow. The experience, in short, was phenomenal! We stood with a group of other spectators directly at the end of the southern runway on the western side of the airport nearby to the massed tower cranes currently constructing Terminal Five. At 6.55pm an onlooker saw that Concorde was lining up at the far end of the runway. My younger son was hoisted upon my shoulders and with a warning to "cover your ears!" we heard the aircraft's approaching rumble which soon grew to a low roar. And then the unforgettable image of this great delta wing rearing up directly in front of us from above the bushes. 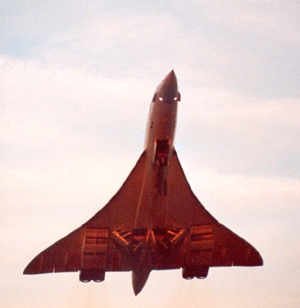 With the sun low in the west glowing orange and reflecting on the underside of Concorde, and the great roar as she past hardly 100 feet above us at over 250mph, the sensation was indeed phenomenal. The ground shook and the noise was probably the loudest I had ever experienced.Turning to follow her, the re-heat of the four engines was clearly visible as she slowly climbed. Wait for the wind! After a few moments we could feel a breeze blowing past. This is the turbulent wake that Concorde leaves behind her and is created by the great delta wing. 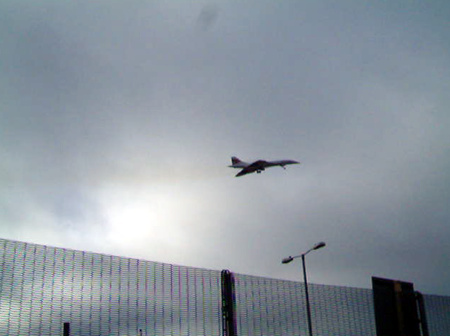 Then a moment later we saw the re-heat turned off as Concorde reduced power to pass more quietly over the nearby residential areas. The re-heat is turned on again for a few minutes over the Bristol Channel as Concorde climbs and accelerates to supersonic speed. It is not only curious visitors and aircraft aficionados that line the areas around the end of the runway to witness this exciting event! British Airways crews themselves were to been seen stopping their crew buses to watch Concorde roar overhead! My children and I made the trip to Heathrow many times to watch both landings and take-offs and continued to do so until the very last flight. For those who have even only the slightest interest in aircraft, it was a remarkable experience. To witness such a unique technical achievement and the drama of a take-off just a few feet above your head, really was breathtaking!!! As Concorde will never fly again, this article is retained here by way of record only. In the final of week of operation all Concorde departures and landings will attract significant crowds, culminating in a triple landing at some point between 3.30pm and 4.00pm on October 24th when three Concordes will land one after the other at Heathrow by way of a final farewell. One will be returning from a farewell stop in Edinburgh, a second will be returning from a trip out to the Bay of Biscay and the last aircraft to land will be the final service BA002 from New York. You will get a good idea which area of the airport to aim for by looking out for other aircraft departures as you get close the Heathrow. Once at the airport, look out for the crowds! In our view anywhere close to the end of the departure runway is good, but if you can be right under Concorde as she flies out, so much the better! Take ear plugs, or at least a damp tissue which makes a good substitute! Allow a good 15 minutes before scheduled departure but if you really want to 'cut it fine' Concorde is very unlikely to take-off within 10 minutes of the scheduled time due to taxiing and other aircraft departures. The departure time of the New York service BA001 is scheduled as 6.30pm, and the actual take-off can be anytime from 6.40pm onwards. Feel free to ask anyone with an airband radio what the latest news of departure is. You will find them all very friendly and keen to make sure you are kept informed. 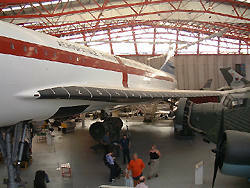 The ConcordeSST web site also has all sorts of Concorde news and information plus a lively forum too. Although Concorde normally departs for New York 7 days a week at 6.30pm, there are certain dates in October when this service does not operate as the aircraft are involved in farewell visits in America. the concordesst web site has full details. Our visit was made on September 13th 2003 with my eight year old son. The glorious sunshine of the late summer was definitely welcome as there is a lot of walking to do! There are a number of hangars, some original World War One listed buildings, although one gap is the result of a deliberate blowing up of one of these hangars for the film 'The Battle of Britain'. 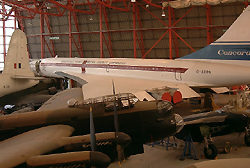 There are three newly built hangars, one featuring British aircraft, including Concorde and illustrated below, another featuring American aircraft including a DC3, a B52, a U2 and a 'Blackbird'. The third hangar is given over to displays of ground equipment, guns and vehicles from the First and Second World Wars. Yeovil. BAC Concorde G-BSST (Prototype 002) is now on permanent display at the Royal Naval Air Station, Yeovilton, Somerset, on behalf of Science Museum. Yeovilton Web page. A Concorde for Yorkshire? British Airways announced that the Yorkshire Air Museum was on a shortlist of locations to receive one of their retiring Concorde supersonic airliners but at the end of the day the museum was unlucky. Germany. Air France Concorde F-BVFB, has been sold for one symbolic euro to the Auto und Technik Museum in Sinsheim, Germany. The aircraft was partially dismantled and taken by road, then by river, then road once more to the museum where it is due to be on display beside its Russian lookalike, the Tupolev 144. Linked below are a series of remarkable photos of Concorde travelling by river in Germany to a museum. [Needs IE Explorer 5] Click the blue dots on the map link below, then [zurück] or [weiter] to see next or previous pictures. 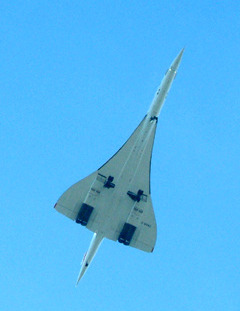 The possibility of a flying 'Heritage' aircraft, available for airshows and special events, was the subject of much speculation amongst Concorde enthusiasts. However Airbus Industrie have no desire to assist with maintaining an airworthy Concorde, and as their support is essential for this possibility to become a reality, we will never see a Concorde in the air again. British Airways and Air France have announced that Concorde will be withdrawn from passenger service in October 2003. Following the Paris disaster, BA only modified two of its Concorde fleet with fuel tank Kevlar linings and other safety improvements such as redesigned tyres. In the light of major difficulties in the airline industry, a general downturn in prestige air travel, plus some loss of faith in the aircraft itself (unjustified! ), the decision is understandable but nonetheless will sadden its many admirers. See below for earlier reactions. Fly in supersonic style on Concorde flight BA1215 when it arrives in Boston on Wednesday, October 8th, 2003, or on Concorde flight 1223 when it arrives in Washington D.C. on Tuesday October 14th, 2003. British Airways has created special round trip options that combine travel one way from either Boston or Washington to London on British Airways' regularly scheduled subsonic services, returning to either of these cities on these one-time supersonic Concorde services. A Hint of 'Concorde' back in the air? Concorde re-commenced transatlantic flights today. At 10.45 Concorde departed Heathrow in spectacular fashion. Either she was very light, or the captain put on a special 'no holds barred' full throttle display for his passengers and the crowds of onlookers at Heathrow, but it was obvious that Concorde was at maximum power (although without 'reheat' over Windsor) and significantly higher than normal, as she passed overhead for her first commercial flight to New York for more than a year. We have seen Concorde on rare occasions in recent months following extensive fuel tank modifications and recertification but as most of this test flying was undertaken from RAF Brize Norton in Oxfordshire, Windsorians saw little of her in the skies over the castle. But today she is back with a vengeance! And The Royal Windsor Web Site welcomes her proudly. Prime Minister Tony Blair must think the same way as he uses a second Concorde this afternoon to fly to another meeting with President Bush. We wish him well and we wish Concorde well. You might be just a little noisy, but I for one can live with that, you are just so beautiful! Following the disaster at Charles de Gaulle Airport in Paris in 2000, much very costly work was undertaken on the safety of the Concorde supersonic airliner and it has been reported, as Concorde celebrates the 25th anniversary of its first commercial flight, that services may resume in the spring of 2001. It is to be hoped therefore that Concorde passes her safety tests and that once again we can cast an eye upward to a unique aircraft. Update June 2001. Concorde is expected to re-enter service in Autumn 2001 following kevlar ('bullet proof') lining of its wing tanks, newly developed and reinforced tyres and other modifications designed to prevent a recurrence of the Paris disaster. The installation of the wing tank linings has been a time consuming process requiring an individual engineer to crawl into a very restricted area and press each tailor made lining into its allotted position. With clearances of perhaps only 20 inches, the job has been slow and extremely difficult! Update November 2001. Concorde re-entered service in November 2001. In October 2001 spectators at Heathrow cheered the take-off by Concorde on a proving flight to the US. The arrival in New York made live national TV news, such was the symbolism of Concorde's return to a city still numbed by '911'. Booking has now resumed for commercial passengers. With the added weight of the kevlar fuel tank linings etc. the aircraft weight has increased. This has been offset by the introduction of new leather seats which it is claimed are lighter than the previous aircraft seating, but just as comfortable! Update June 2002. Concorde momentarily stole the limelight as she flew in tribute to HM The Queen at the conclusion of the celebrations in The Mall on June 4th, the National Golden Jubilee Day. Accompanied by the nine aircraft of The Red Arrows Air Display Team trailing red, white and blue smoke, Concorde flew overhead, the last contingent in a short flypast. After passing over Buckingham Palace at 1500 feet (450 metres), Concorde dramatically accelerated upwards as The Red Arrows broke away left and right. For ten minutes Heathrow Airport had been closed to allow the flypast to take place at 6.25pm, 30 minutes later than originally planned. Concorde had taken part in a similar fly-past 25 years earlier on the occasion of the Silver Jubilee celebrations in 1977. Whisper it quietly, but Concorde first flew in passenger service the year before, in January 1976, though it really doesn't feel that long ago! Update April 2003. 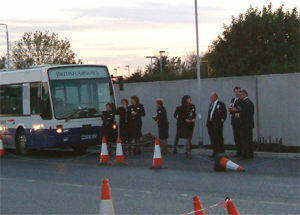 Concorde to be withdrawn from service in October 2003.